‘Our first move was to contact architect Colin Sturrock, who was recommended to us by a friend. Although we knew what we wanted, Colin was able to interpret our ideas and see the plans through to approval stage at the local planning department. We wanted to knock down the wall between the kitchen and dining room and extend into the garden, incorporating a complete wall of sliding glass doors to maximise the natural light. I was disappointed to discover that planning restrictions relating to green carbon rules meant we couldn’t have the number of doors we’d planned. ‘Colin suggested installing Velux windows in a vaulted ceiling on the extended side, which kept us within the restricted glazing limits. The solution has worked really well and given us a light-filled space. ‘Once our plans were approved, I asked Rosewood Building Services to complete the building work – a neighbour had recently used them and I was really impressed with their standard of finish. We also wanted Rosewood to fit the kitchen as it would be easier to coordinate than using the supplier’s fitters. Once the work began we had only a microwave and kettle in the utility room for preparing meals. ‘Meanwhile we started visiting several kitchen showrooms and were particularly impressed with John Lewis. Its range of kitchens is extensive and we trusted them as a company to provide a good service. ‘As it’s a modern house, I wanted sleek, handleless units with a highgloss finish, though I was wary of sticky finger marks. The high-gloss, woodeffect units at John Lewis were just the look I was after – and choosing a grain effect, rather than a plain finish, meant finger marks weren’t such an issue. ‘I wanted to keep the colour palette simple, so we settled on a white Corian worktop to go with the tobacco walnut cabinets. Corian is a seamless design, which hasn’t any hard edges, and it feels very tactile. It actually makes cleaning the worktops a pleasure rather than a chore. ‘We were keen from the start to have a striking splashback and liked the idea of coloured glass – this was always going to be either purple or green and, although it’s a bold choice, we’ve used purple in the rest of the house so I knew we’d be able to live with it. We also went for green as an accent colour for the light fittings and sofa. ‘The island unit has been a great success, but it took a long time to work out the best configuration around the supporting pillar. In the end we decided to have a small space between the island unit and the pillar rather than incorporating it into the island. It looks odd on paper but in reality it works. ‘The lighting has been an important consideration in this kitchen because we wanted the room to be bright – there’s nothing worse than preparing food in an under-lit kitchen. Under-unit lighting and pendant lights either side of the hob are all on one circuit and illuminate the length of the worktop. 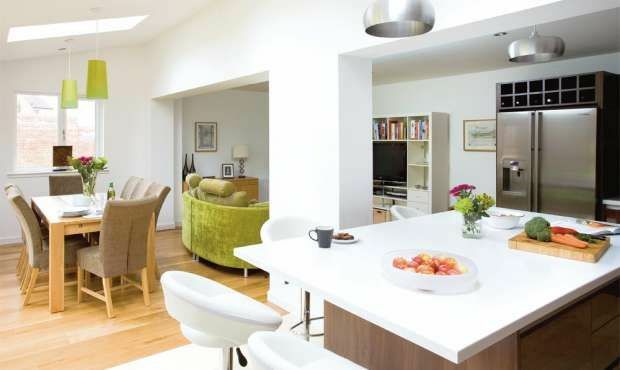 ‘The kitchen, dining and living areas can all be lit separately and are on dimmer switches to create different moods. This helps to divide the big space into zones – so after a meal we can simply turn the lights down in the kitchen and forget about all the food preparation that still needs to be cleared away.